University of Delaware Hillel volunteers. When you think of spring break, you think of heading for the beach and lying in the sand. But Chloe Sommers, a member of the Hillel of the University of Delaware, had other plans. She went with other students to help with relief efforts in the Gulf States recovering from the damage following Hurricane Katrina. Sommers, a sophomore majoring in Communications with a minor in Italian, says, "We took a full week for spring break and went down to Mississippi, for a whole week from Sunday to Sunday. We stayed with Presbyterian Disaster Relief, and they built a camp site for us; we had pods and tents we stayed in." Sommers? group, ten students and a faculty advisor, stayed at a campsite on the grounds of a church that was converted to a disaster relief hotline center. Students from other universities, such as UC Berkeley, Brown, and MIT joined them. The workers? day started with discussions about Jewish teachings on performing tzedakah, or social justice, reading from packets of literature provided by Hillel. "Every morning," says Sommers, "we woke up at six, went to our site, and we would shingle and rebuild the roofs (of houses). The week that we came, the job was to rebuild the roofs. 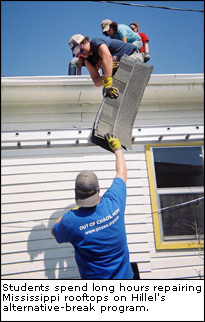 Other weeks, it's to do molding, or clean out the houses, but we did roofs." What started Sommers to take part in this activity? "I'm a communications major," she says, "and I was interested in what happened down there, what it really looks like. All I knew, I learned from the television, radio and newspapers, so I wanted to go down there and see it for myself. Were the media correctly representing what was really going on down there. Is it still really that bad and do they need more help at this stage, after Hurricane Katrina." Was the damage from Katrina as bad as the media portrayed? "I found they did a very good job in portraying what happened down there," says Sommers. "The news is quick-paced, they don't cover it as I think they still should, they still need a lot of help down there. I think it's more on the back burner now than it should be, and I think it should be brought back to the attention of people that are not involved in the South or know anything about the South. I'm from New Jersey, so I've never been that far south. I wanted to go down to relate what's going on, and to try to gather support to go down there." Sommers says her crew was received by the people of Mississippi with "Southern hospitality. I never experienced it before, but I experienced it there. When we went out to eat, everyone could see we were very dirty from the roof and the hard work. They asked what we were doing there; we didn't have an accent. They were just thanking us, they appreciated (the work) and they said, 'Bring more people down.'" Sommers encourages others to do just that. She recommends going on the Hillel website for information on performing relief work in the Gulf States and similar activities.